Exploitation films tend to be notable for their brevity, whether due to budget constraints (especially back in the celluloid era) or simply an admirable desire to get to the disreputable stuff without delay. S. Craig Zahler, however, is in no damn hurry. There’s horrific gore aplenty in his feature debut, Bone Tomahawk, but most of the grisliness is preceded by leisurely, digressive scenes in which the characters trade flavorful Old West banter. 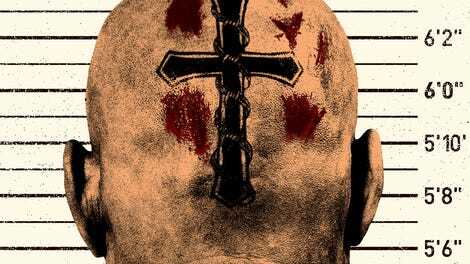 The film runs a whopping 132 minutes—and so does Zahler’s follow-up, which boasts the raw-meat title Brawl In Cell Block 99. (Presumably an homage to Don Siegel’s 1954 cheapie Riot In Cell Block 11, recently added to the Criterion Collection). Eventually, this methodical nightmare journey does serve up extreme violence that sorta, kinda qualifies as a brawl. It takes an hour and a half for the film to reach cell block 99, though, and a good 45 minutes elapse before its protagonist even goes to prison. In theory, that sort of dawdling ought to be a drag. Who wants their trash delivered at the glacial pace of an art film? Zahler is such an imaginative writer and skilled director, however, that his movies feel exactly as long as they need to be. Brawl In Cell Block 99 takes the viewer step by appalling step through the ordeal of Bradley Thomas (Vince Vaughn), who’s introduced getting laid off from his job at an auto shop and then discovering that his wife, Lauren (Jennifer Carpenter), is having an affair. This latter detail perfectly illustrates Zahler’s modus operandi. That Lauren has been cheating on Bradley doesn’t really matter, narratively speaking—the story would function just fine if she didn’t. Bradley’s reaction, on the other hand, is crucial to understanding who he is. He lashes out violently, but not at Lauren. Instead, he more or less tears her car to pieces with his bare hands. Then he goes inside and speaks to her calmly and compassionately, seeking to understand how he may have inspired her betrayal, and to preserve their marriage. It’s a remarkable, counterintuitive sequence that sets the tone for everything that will follow. Equally remarkable and counterintuitive is Vaughn’s performance. He pulls a Bruce Willis here, shaving his head and substituting intimidating stillness for his trademark motormouthed hyperactivity. The transformation suits him surprisingly well. Granted, Zahler also writes a bunch of terrific, laconic one-liners—when someone asks Bradley if he’s okay, for example, the reply is, “South of okay, north of cancer”—but the role mostly requires an actor who can convey stoic calculation, and Vaughn delivers. Bradley does wind up in the slammer, and spends the rest of the movie attempting to save Lauren, who’s been kidnapped, and their unborn child. In order to do this, he’s supposed to murder a specific prisoner in cell block 99, by a fast-approaching deadline. Trouble is, Bradley’s not in cell block 99. In fact, he’s not even in the right prison. Zahler devises an elaborate plan, but no part of it is ever revealed in dialogue; we simply watch Bradley act, as he repeatedly shifts on a dime from silent observer to superhuman badass. Ultimately, it’s the playful postponement of what the title promises that gives Brawl In Cell Block 99 its pleasurably shaggy-dog vibe. Toss those expectations aside and there’s no wasted energy to be found. Every scene has verve and wit and a clear purpose, getting Bradley closer to his destination and destiny—it’s just a more roundabout path than this sort of movie usually takes. Zahler throws in a couple of first-rate twists (including the revelation about why Bradley has been ordered to do the hit), and the entire supporting cast—Clark Johnson as an understanding cop; Fred Melamed as an officious intake employee; Don Johnson as a sadistic warden; Udo Kier as the latest in his endless roster of creepy dudes—is superb. Gorehounds, too, will eventually get what they came for, as the so-called brawl involves less punching than it does skull-stomping and face-scraping. (Anyone with phobias about severe damage to the human head should stay far away.) The film’s true target audience, though, is patient connoisseurs of highbrow-lowbrow combo platters who are eager to watch a modern Lee Marvin (yes, still talking about Vince Vaughn; really, you’ll be amazed) navigate a slow-motion descent into hell. Settle in and luxuriate.